Paddy Power ambassador was speaking ahead of the Dublin Racing Festival. WHEN RUBY WALSH was sitting in the back of the ambulance after his heavy fall from Let’s Dance at Punchestown on 18 November, he knew he’d broken his leg. His first thought was whether or not he’d be fit in time for the Cheltenham festival in March and he quickly worked out he should be okay. Since then, preparing for Prestbury Park has been an almost singular focus for Walsh, but a very close second was the slim hope he might recover in time for the inaugural Dublin Racing Festival this weekend. “It’s a funny one,” the Paddy Power ambassador said at a press conference today ahead of the event. You can mask a lot of things. You can ride with a fracture in your arm or a crack in your wrist. You can ride with an arm and a half, but you need two legs. “A broken leg is 12 weeks minimum, whatever way you look at it, and you can’t mask riding with a broken leg. “When you’re absent and you’re not getting something you want it more. You’re hungrier, you’re fresher and you can’t wait for it. “When you’re pushing yourself through rehab and you’re counting down the last 15 seconds, in order to keep that drive you start thinking about what you’ll be riding in Cheltenham. There was very little leeway, and that probably made me try a little bit harder, but I think when you’ve missed any sort of time, your appetite is so strong, it doesn’t matter where the racing actually is, you just want to get back. While Walsh is unsure exactly when he’ll be back, he is very confident he’ll be race fit in time for Cheltenham. “[My recovery] is going well, it’s 11 weeks tomorrow. “I’m out in Santry a couple of days a week and I’ll have more x-rays again next week but they’re just the normal 12 week x-rays for a broken leg. I’ve reached every target so far, so I don’t see why I won’t reach the rest of them. One horse Walsh is hoping to get back on board at Cheltenham is Faugheen. The Willie Mullins trained 10-year-old earned the nickname ‘The Machine’ after winning 13 of his first 14 runs over fences. However, he put in a lacklustre performance in the Ryanair Hurdle at Leopardstown over Christmas before being pulled up and Walsh says the biggest problem is that nobody is sure exactly what the issue was that day. “I think if he does what he is doing at home, then he’ll do what Faugheen has always done bar once,” says Walsh. ”He’s working really well and he’s in really good order. “Of course there’s the worry, as Willie has explained in far more detail and better than I’d ever explain it, there is a worry that the same thing will happen again. When you can’t explain what happened, when you can’t find a reason for what happened, then you can’t correct what’s happened. That’s if there is something to correct, maybe there’s nothing to correct but we won’t know that until he runs tomorrow. “I suppose it’s the uncertainty. You’d love there to be no uncertainty, you’d love to be going there gung-ho, 2/11 and saying ‘bring on March’. But now you’re going hoping he does what he’s doing at home, and not what he did at Leopardstown at Christmas. “Everyone has a theory about what happened but there was no veterinary advice, the farrier didn’t say anything, there was nothing you could put a finger on. But I know if I was going tomorrow, I’d have blanked out Christmas, like it never happened. “Maybe that’s the optimist that a jockey always is, that you just blank out the bad things and go with the good ones. 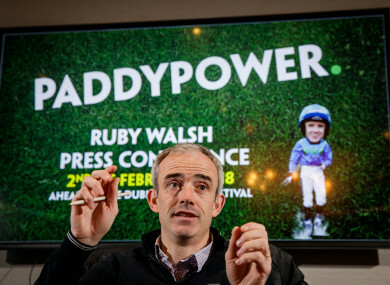 Paddy Power ambassador Ruby Walsh was speaking ahead of the Dublin Racing Festival in Leopardstown on Saturday 3 and Sunday 4 February. Email “'You can ride with an arm and a half, but you need two legs'”. Feedback on “'You can ride with an arm and a half, but you need two legs'”.